With good looks gaining more importance than ever, you can no longer be excused for airport style casualties - even if you are a frequent flier. 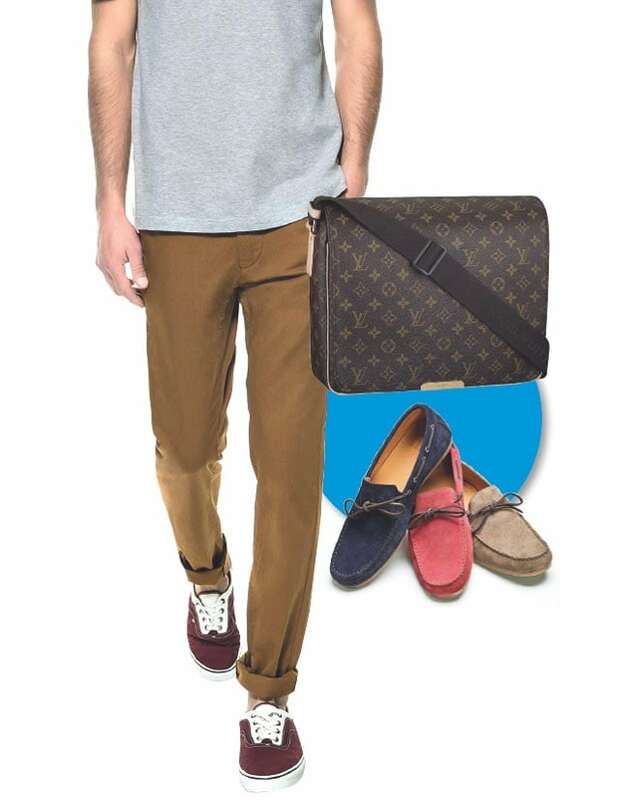 Here's everything you'll ever need to make a dashing impression when on the go! In the corporate world, hectic times call for long-haul flights. And even during those not-so-hectic times, you may find yourself hopping from one airport to another. On days that you're busy thinking about your next meeting, conference or presentation while in transit, considerations about the way you're dressed tend to take a backseat. We all want to make sure we're comfortable when sitting through a long-haul flight, and looking good - let's admit it - isn't a priority. But, in supremely fashion-conscious times such as ours, to err is no longer human; it is just so last season! The eternal fashion debate might not have a clear solution but it certainly has a happy midway. Being comfortable in what you wear is of utmost importance when you're trapped inside a plane for 8 hours at a stretch or even more, Designer Varun Bahl feels the tide has turned in recent times. He says, "There was a time when everyone would overdress to catch a flight, yet now no one bothers to even look decent. While you certainly should be comfortable on a flight, it is no reason for you to look shoddy." With many stylish yet comfortable clothing options available just for travel, being caught at an airport wearing your track pants and sweats is no longer acceptable You don't have to dress up, just dress smart. A formal jacket with jeans or formal trousers, and a shirt teamed with a smart jacket are good semi-formal looks that are both comfortable and trendy. The trick as per ace designer Ravi Bajaj is, "Go for clothes that are wrinkle resistant, breathable and soft." Your best bet would be cotton and linen that are easy to wear for long durations. And while linen does get difficult to maintain after some time, there are no such issues with cotton. If you happen to be a denim person then make sure you opt for softer denim fabric during travel. Start by getting the basics right and invest in a good pair of chinos. These are not as formal and uncomfortable as trousers but are high on the trend wagon. Besides, they allow you to stretch your legs effortlessly so you don't feel cramped on a long flight. Chinos are also warmer than regular trousers and the sudden drop in temperature on a flight won't make you uncomfortable. Brands such as Zara, Calvin Klein, Tom Ford and Paul and Shark offer great options for chinos and you can choose a subtle or bold shade depending on your style. If chinos are not your thing, denims are a good option. Just make sure they aren't too clingy on the waist or the legs as sitting in tight clothing on a long flight can prove very uncomfortable. If you want something even more comfortable, then linen pants are a great style option. Depending on the weather (both where you take off from and where you land) get yourself a well fitted jacket but something that does not scream 'office wear'. It is a tried-and-tested formula and never goes out of style. "Pair your jacket or blazer with chinos or linen pants and you can even turn it into a smart semi-formal look good enough if you are meeting some workmate or heading for a conference immediately post your flight. Just remember to hang your jacket separately during the flight," adds Varun Bahl. For those wondering if a jacket is only suitable during winters, say hello to fashionable summer jackets that use lighter fabric and are uber stylish. Get yourself one in a neutral shade that goes with most colours and if the regular cotton jacket sounds too staid, opt for one in leather or denim. Remember though, leather or denim jackets are paired best with easy jeans and could look tacky if not accessorised with the right pants. Opt for a casual shirt or t-shirt, depending on where you need to head to when you land. Just make sure that the shirt isn't too loud or screams boring work wear as neither is a good travel option. As for your t-shirt, make sure to get a plain one as these look really smart when worn under a well-fitted jacket. Also keep a check on the length of your t-shirt and make sure it isn't too long as that can kill your look with one stroke; also remember to never ever tuck your t-shirt in. It is truly bad form! Designers also suggest you opt for plain collarless t-shirts that are available in myriad colours and team well with a jacket and chinos/jeans. You could also opt for a polo t-shirt. As far as footwear goes, you never wear black formal shoes with your jeans or chinos. After all, moccasins and loafers exist for a reason, right? "Flat shoes such as moccasins and loafers are made of breathable fabric and are easy to slip on and off making them ideal for travel" feels designer Ashish N Soni. If open footwear is your thing then sandals are a great option but not the kinds you wore as a kid. Go for leather ones which are classic instead. Slippers that don't look like you wore them straight from the restroom are okay as well. Considering you're going to be 'locked' in an airplane for quite a while, heavily accessorising your look doesn't really make sense. However, there are a few things you must carry and one of them is the man-bag. For those who came in late, a man bag has been the coolest accessory in town since last season; everyone from Ryan Gosling to David Beckham abroad and Ranbir Kapoor and Arjun Rampal closer home has been flaunting it in style. It could be a messenger bag, a tote or a duffel and carryall bag. Get one in either black leather, tan or opt for a funky, bright shade and notice heads turning the next time you're in an airport. Some great options are available at brands such as Kenneth Cole, Calvin Klein Jeans and Louis Vuitton. A man-bag is spacious enough to fit in all your basics including grooming items, wallet, phone charger, iPod etc and makes for a great replacement to the boring handbag. Another must-have accessory is a decent pair of sunglasses. You can also add on a scarf to your look if travelling in winter, but make sure it is a patterned one and you are knotting it the right way. A hat for a beach-side location and a beret if headed to a cold place is also a great idea. There are a number of occasions when you have to head directly to a meeting/conference from the airport and you are not keen on changing your outfit at the end of the flight. In such times, board the flight in formals that work. While you can't do anything about your trousers and shirt, you can easily carry a spare jacket and keep your formal one neatly hung on the aircraft in mint condition. "If you can avoid wearing a suit for the meeting then a cashmere sweater that is easy to manage over a shirt or next to the skin with your denims is a good option too," adds designer Ravi Bajaj. Keep aside any other piece of clothing that you can to make sure it is as fresh as possible once you land. And of course, stick to wrinkle-free variants. Clothes aside, it's important to step off the aircraft looking fresh and professional, even if you haven't had much shut eye. A good grooming kit should include a face wash, moisturiser, electronic trimmer, hair gel and mouthwash. While chances are that you will be flying business or first class on corporate travel and a grooming kit is given to you on board, stick to your own products. About an hour before the flight lands, head to the washroom. Wash your face with a good facewash, get rid of any evening stubble, rinse your mouth to get fresh breath and style your hair appropriately if it looks like you have been sleeping on it! You have to take care of yourself and your body through the duration of the flight to make sure you exit looking as fresh as possible. Cotton-mouth, bloodshot eyes, chapped lips and dry skin are some of the most common after-effects of a long-haul flight. To deal with these, keep yourself well hydrated by drinking water as regularly as possible and avoiding the intake of alcohol, tea and coffee or keeping it to bare minimum. Ideally, drink 30 ml of water every hour if you can. One of the most common problems of long flights is jet lag caused by crossing time zones. Jet lag can leave you tired, bad tempered, sleep deprived and constipated. To avoid all of these, try and get some quality sleep though that can be tough if you are not a keen traveller. Try and eat a banana before sleeping as it contains the amino acid tryptophan that aids restful sleep. No one expects you to roll into a meeting in a remote corner of the world looking like you stepped off the runway but given the mad pace of corporate life, every second counts and it helps to be prepared. It also doesn't hurt to look decent even if you are not rushing off for a meeting right off the flight; after all you never know who you will bump into at an airport lounge or on the flight and it would not bode well if you came off looking tacky or shabby. You are representing your company or yourself after all!